After one of his concerts, Jackson Maine (Bradley Cooper) is searching for his next drink. He makes his way into what turns out to be a drag bar to order a drink. While he is swarmed by fans who recognize him, a woman named Ally (Lady Gaga) comes to the stage. Ally is one of the only women allowed to sing in the bar. Enamored by Ally’s voice and the way she performs, Jackson invites her to another bar to get a drink. The pair end up spending most of the night getting to know each other. Jackson invites Ally to one of his concerts, an invitation she has to turn down because she has to work. When her manager yells at her for being late again, Ally quits her job and is jetted off to Jackson’s concert. As she is watching from the side of the stage, Jackson drags her in front of the crowd to perform a song she had written. Ally initially refuses to join him onstage, uncomfortable singing her own songs, but she quickly changes her mind and is met with a huge applause from the crowd. After one of the concerts, Ally is approached by Rez (Rafi Gavron), a record company representative. When Rez signs Ally to a record deal, he immediately begins changing her look and personality to make her more of a pop-star icon. Unhappy with the direction of her new career, Jackson and Ally find themselves at odds over how she her image is being transformed. Jackson’s drinking and drug use highlight the cracks in their relationship and pushes to a boiling point. 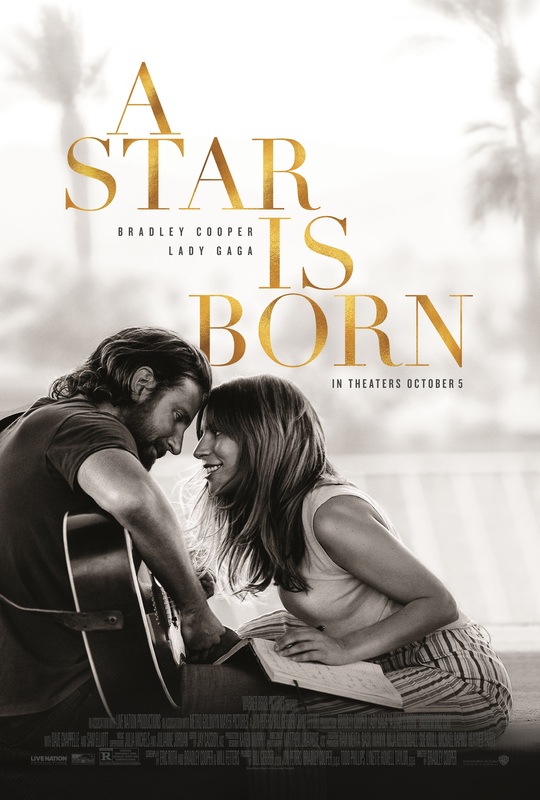 A Star is Born, a remake of a slew of films of the same name dating back to the late 1930s, is Bradley Cooper’s directorial debut and Lady Gaga’s first starring role. Given the talent and success of Cooper and Gaga in their previous roles, it is no surprise that the film is so well-crafted. Bradley Cooper’s Jackson Maine is a deeply flawed character, and one Cooper plays with expertise. The drinking and prescription drug abuse and its resulting behavior are all too common among musicians. Cooper sells the performance as so few can. He uses a gravelly, Sam Elliott style voice and intonation that is fitting not only for the character himself, but also shows the relationship between Jackson and his brother/manager played by Elliott. It is a solid performance. Lady Gaga could not have chosen a better role as her first lead. If you didn’t know better, you could almost assume this is the story of Gaga’s rise to fame. And that voice. Whether or not you like Gaga’s onstage persona, it is impossible to deny her talent. On top of her singing, Gaga brings such emotion to the role of Ally. She is struggling not only with her hesitance to be on stage and her newfound fame, but also with Jackson’s vices. Aside from Elliott, the other cameos and supporting cast, including a surprisingly reserved Andrew Dice Clay and Dave Chappelle, all add to the film. Jackson Maine comments to Ally, “Talent comes from everywhere, but having something to say and a way to say it so that people listen to it, that’s a whole other bag. And unless you get out there and you try to do it, you’ll never know.” It seems Cooper listened to his character’s advice. Making the move into directing means he had to step out of his comfort zone. The result is a powerful film with something to say. Cooper and Gaga also wrote original songs for the film and performed them live during filming. This, obviously, isn’t really a stretch for Gaga. It seems it wasn’t really a stretch for Cooper, either, as their voices meld in every song and highlight the emotions of the film. I’ve never seen any of the previous takes on A Star is Born, which is probably a good thing going into the film. It means going in without any preconceived expectations. I was enamored with both the story and the performances. If you can, find a theater with an updated sound system. You will be blown away by the attention to detail in the sound.